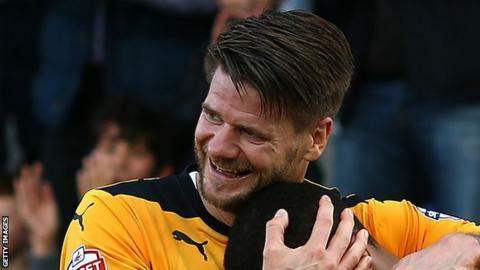 Michael Nelson's late header rescued a point for 10-man Cambridge United against Tranmere Rovers. Rovers substitute Cole Stockton put the hosts ahead, turning in Liam Ridehalgh's left-wing cross. The visitors' task was made even tougher moments later as Robbie Simpson was shown a second yellow card for fouling Steve Jennings. Nelson's header from Sullay Kaikai's corner earned the U's a draw, with Stockton wasteful for Rovers late on. Match ends, Tranmere Rovers 1, Cambridge United 1. Second Half ends, Tranmere Rovers 1, Cambridge United 1. Attempt missed. Cole Stockton (Tranmere Rovers) right footed shot from the centre of the box is too high. Substitution, Cambridge United. Luke Chadwick replaces Jordan Chiedozie. Foul by Cole Stockton (Tranmere Rovers). Liam Hughes (Cambridge United) wins a free kick in the attacking half. Goal! Tranmere Rovers 1, Cambridge United 1. Michael Nelson (Cambridge United) header from the centre of the box to the bottom right corner. Assisted by Sullay Kaikai with a cross. Corner, Cambridge United. Conceded by Marcus Holness. Liam Ridehalgh (Tranmere Rovers) wins a free kick in the defensive half. Foul by Tom Naylor (Cambridge United). Substitution, Tranmere Rovers. Guy Madjo replaces Shamir Fenelon. Attempt saved. Liam Hughes (Cambridge United) header from the centre of the box is saved in the centre of the goal. Attempt missed. Shamir Fenelon (Tranmere Rovers) left footed shot from the centre of the box is close, but misses to the left. Foul by Liam Ridehalgh (Tranmere Rovers). Tom Naylor (Cambridge United) wins a free kick on the left wing. Attempt missed. Marc Laird (Tranmere Rovers) right footed shot from outside the box is close, but misses to the right. Attempt missed. Max Power (Tranmere Rovers) right footed shot from outside the box misses to the left. Second yellow card to Robbie Simpson (Cambridge United). Goal! Tranmere Rovers 1, Cambridge United 0. Cole Stockton (Tranmere Rovers) right footed shot from the centre of the box to the bottom right corner. Assisted by Liam Ridehalgh with a cross. Attempt missed. Liam Hughes (Cambridge United) right footed shot from more than 35 yards misses to the right. Corner, Cambridge United. Conceded by Owain Williams. Attempt saved. Sullay Kaikai (Cambridge United) right footed shot from outside the box is saved in the top left corner. Foul by Steven Jennings (Tranmere Rovers). Attempt saved. Marc Laird (Tranmere Rovers) header from the centre of the box is saved in the centre of the goal. Substitution, Tranmere Rovers. Cole Stockton replaces Kayode Odejayi. Foul by Marc Laird (Tranmere Rovers). Marc Laird (Tranmere Rovers) is shown the yellow card. Tom Naylor (Cambridge United) wins a free kick in the defensive half. Attempt blocked. Sullay Kaikai (Cambridge United) right footed shot from outside the box is blocked. Robbie Simpson (Cambridge United) wins a free kick in the defensive half. Foul by Marcus Holness (Tranmere Rovers). Attempt saved. Shamir Fenelon (Tranmere Rovers) right footed shot from the right side of the box is saved in the bottom right corner. Attempt missed. Jordan Chiedozie (Cambridge United) right footed shot from the right side of the box misses to the left. Substitution, Cambridge United. Jordan Chiedozie replaces Ryan Bird. Substitution, Cambridge United. Sullay Kaikai replaces Adam Cunnington because of an injury. Attempt missed. Kwesi Appiah (Cambridge United) right footed shot from outside the box is high and wide to the left.